Welcome to Civil Air Patrol Squadron 131. Please join us for an exciting public service involving Air and Ground Search and Rescue, Disaster relief, Airborne Photography, Aerospace Education and Cadet Programs. We are located at the Santa Barbara Airport Administrative Building (see below). Our entrance is behind the building. 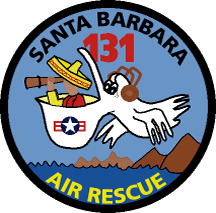 Thanks to for their support of the Squadron 131 Internet connection.